Pre-sail training for Exercise Cutlass Express has concluded. Sailors from around the globe completed classroom and mock visit, board, search and seizure (VBSS) training with participating nations as part of exercise Cutlass Express 2019 on 31 January. The VBSS training was designed to prepare participating military forces for at-sea boardings in the next phase of the exercise. The training began at the Mozambique Naval School Jan. 29 with several hours of classroom instruction. The training included demonstrations and drills on close-quarters combat, medical readiness and proper search and detainment techniques. The first phase of training concluded aboard the French Patrol Ship Le Malin (P 107) and Mauritius Kora-class Corvette MCGS Barracuda. 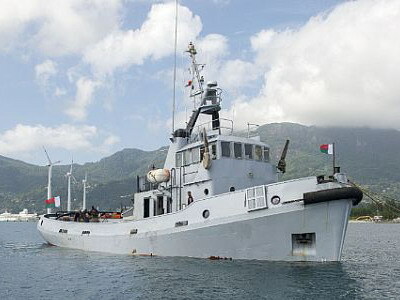 Military members from Mauritius, Mozambique and Tanzania took turns practicing techniques and maneuvers learned in the classroom including boarding and clearing vessels as well as questioning and interrogation procedures. This training was done in conjunction with similar training conducted in Djibouti as part of the same exercise. The Djibouti portion featured the participation of the Arleigh Burke-class destroyer USS Chung-Hoon (DDG 93) and the Indian Talwar-class frigate INS Trikand (F51). Trikland and Chung-Hoon will remain in the exercise operation area during the next phase of training to take part in the scenario-based, at-sea portion of Cutlass Express. Sailors from the Indian navy provided VBSS training to more than 60 students from five countries in tandem with Sailors from the U.S. Coast Guard and Royal Netherlands Marines. Cutlass Express 2019 moves to the second phase of training as participating nations take to the seas to conduct mock boardings on participating vessels. Cutlass Express is designed to improve regional cooperation, maritime domain awareness and information sharing practices to increase capabilities between the U.S., East African and Western Indian Ocean nations to counter illicit maritime activity, the US Navy said.